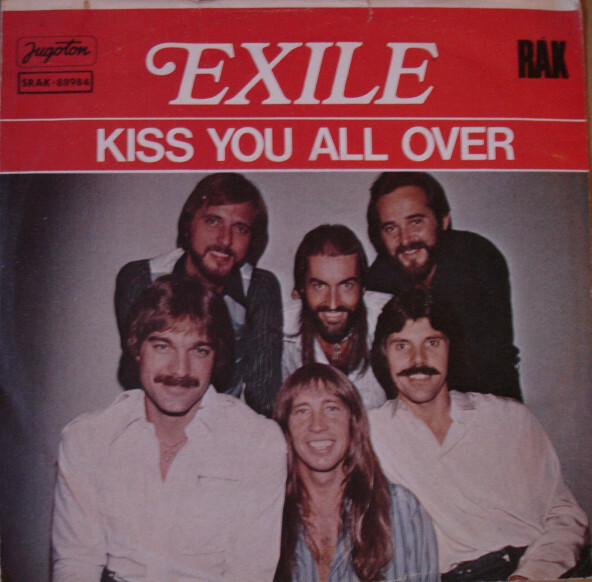 ‘Kiss You All Over’ by Exile spent a 3rd week at 1 but was now coming under pressure from La Bionda’s ‘One For You One For Me’ which moved up from 4 to 2. The previous number 2 (which had also been the previous number 1), Marshall Hain’s ‘Dancing In The City’ dropped from 2 to 5. The Village People’s ‘Y.M.C.A.’ was the climber of the week with a 10 place jump from 20 to 10. It was the 79th time a song had climbed 10 or more in a week. There were 3 other star raters and they were Peter, Sue & Marc’s ‘Cindy’ which moved up 7 from 14 to 7, Nazareth’s ‘Place In Your Heart’ which jumped 5 from 13 to 8 and Linda Ronstadt’s ‘Back In The U.S.A.’ which climbed 4 from 18 to 14. ‘Back In The U.S.A.’ was the 3rd song with ‘U.S.A.’ in the title to chart and all 3 of them had now picked up a star rater. The previous 2 were Middle Of The Road’s ‘Talk Of All The U.S.A.’ and Big John’s Rock ‘n’ Roll Circus’ ‘Rockin’ In The U.S.A.’. Gerry Rafferty’s ‘Baker Street’ took the biggest tumble, dropping 10 from 10 to 20 in a straight place swap with the biggest climber. This was the 20th time the climber and faller had exchanged places and the second time it had been with a record to date 10 place movement. The last time we had seen the climber and faller swap places with a 10 place climb and fall was when Creedence Clearwater Revival’s ‘Someday Never Comes’ moved up 10 from 16 to 6 and The Pipes And Drums And The Military Band Of The Royal Scots Dragoon Guards’ ‘Amazing Grace’ dropped 10 from 6 to 16 on 14 July 1972. ‘Baker Street’ was on 21 weeks in the charts and enjoyed its 6th week as the oldest in the top 20. Billy Joel’s ‘Just the Way You Are’ was the only song to leave the charts this week. It had seen a run of 19 weeks and peaked at 6. This was the 18th song to just miss out on getting to 20 weeks and only make 19. Of those 18, the peak of 6 was the lowest we had seen by 2 places. After All’s ‘Help Me My Love’, Cliff Richard’s ‘Wind Me Up Let Me Go’ and Lucille Starr’s ‘The French Song’ had the next lowest peaks as they all made it to 4 during a 19 week run. The new entry was Dee D. Jackson’s ‘Automatic Lover’. Jackson’s real name was Deirdre Elaine Cozier and ‘Automatic Lover’ was written by the husband and wife team of Gary & Patty Unwin who also performed backing vocals on the song. It would top the charts in Argentina, Italy, Spain, France, Turkey and Japan as well as going to 2 in Sweden, 4 in the UK, 5 in Norway, 6 in Switzerland, 12 in Austria and 22 in Germany. Switzerland caught up with Brazil for weeks in the charts by acts from a nation and the 2 sat tied 18th on 13 weeks and in case you’ve forgotten, Peter, Sue & Marc were the Swiss act picking up the weeks for them. Tommy Dell saw his weeks count move on to 50 and he was the 60th act to reach this many and 15th local act to do so. He shared 14th place on the local weeks count list with The Dealians. Olivia Newton-John moved into the top 20 of the weeks count list, her 83 putting her level with The Staccatos at number 20.